On 18 March 2014 just after 5pm, I received the greatest gift in the world — my precious baby girl. I’ll chronicle the epic labour process in another entry but today, I want to record a memoir of how my princess’ English and Chinese names came about. Names mean a lot to me. A name carries identity, prophecy and destiny. And sometimes, it does feel like if you pick a good name, you’ve got half the battle won. You see, I selected “Asher” as my baptism name because it means “blessed, joyful and happy”, as well as “the most favoured one”. As for our children, we’ve already shortlisted a number of English and Chinese names. The plan was to pick one that described the pregnancy journey. We’ve decided in the second trimester that our firstborn would be named “Eden”, because like her name suggests, she has brought us and others around us so much joy and delight. In Hebrew, it means “paradise” (she’s our utopia after all). And practically speaking, Eden is a simple, two-syllable, and easy-to-remember name. Some years ago, I discovered the meaning of my surname, Chen (陈). While its most obvious meaning represents the sun (阳) that rises from the east (东), it’s actually also pronounced like a Hebrew word (חֵן) that means “loveliness, grace, and favour with God and men”. Not too shabby for one of the most common surnames in the world! We’ve always wanted to name our offsprings after the fruit of the Spirit and since we had “love” and “joy” already working in Eden’s favour, we wanted to select a Chinese name that either described love or joy, or another of the remaining seven parts of the fruit of the Spirit. As a typical ACS boy, I knew I needed some help with picking the right Chinese name for my daughter. So I approached a church friend, Charles, who’s studying for his PhD in Chinese history, who had very kindly agreed to help Huiyi and I pick a Chinese name for Eden. We met for coffee one afternoon and went through a few possibilities. I mentioned to him that I wanted Eden to have a single character (单名) in her Chinese name. So instead of the typical three characters, all my children’s Chinese names will only have two. 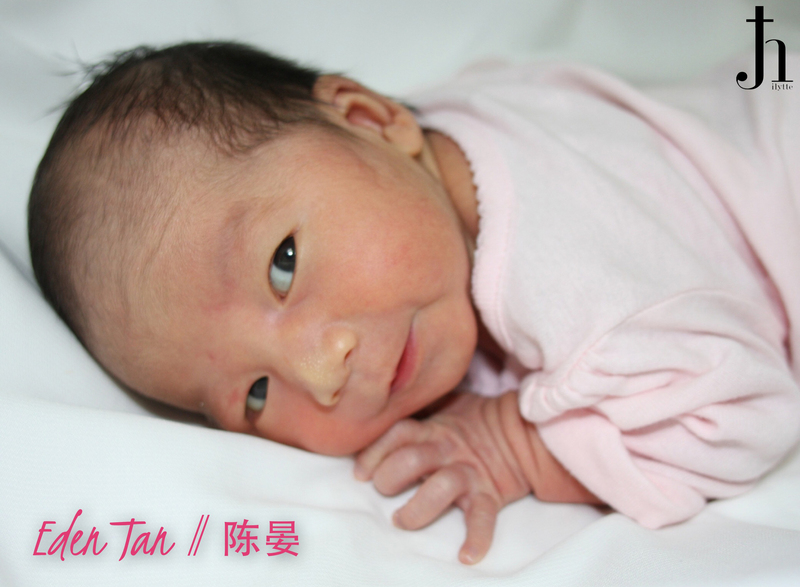 It’s not easy find a name that fits with the dialect and English “Tan” as well as the hanyupinyin “Chen” so we decided that Eden’s given name on her birth certificate will simply show “Eden Tan”, without her Chinese hanyupinyin name. 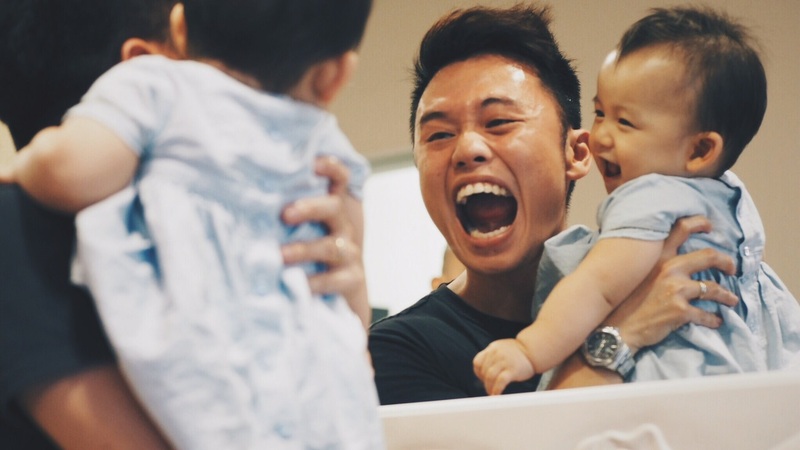 After all, when you do introduce yourself, you don’t say, “My name is Joey Tan Chong Yi” or “你好, 我是Joey陈崇仪 but simply, “My name is Joey Tan” or, “我是陈晏”. After an hour of tossing up possibilities of his initial suggestions and the Chinese names that I preferred, Charles and I went off topic and shared about the respective journeys we’ve each gone through watching our wives get pregnant. Many of which are very private so I’ll leave it that way. But as with several seasons of my life, God has always been teaching me about what it means to surrender… And everyone knows surrendering (to God) isn’t always the most pleasant or easy thing to do. I told Charles that through this process of surrendering, God has really taught me about His peace that surpasses all understanding — that assuring knowledge that He is with me and His presence is all I need. Unsurprisingly, I did not recognise that Chinese character at all. And I’m confident that unless I’ve explained it to you before, or if you’re also studying for your Chinese history doctorate, chances are that this is the first time you’re seeing this character and you, like the rest of the modern world, have no idea how to pronounce “晏”. “It’s pronounced as ‘yàn'”, he explained, “and it means ‘peace'”, he continued. Upon seeing “晏” and perceiving its meaning, it became one of those moments for me. You know, those moments where you kind of know, this is it. I think Charles must have saw it in my eyes too. Like “Eden”, “晏” had a nice ring to it and immediately resonated with my heart. There was a certain sense of conviction about it. I knew there and then (barring consultation with my wife) that “晏” would be Eden’s (only) Chinese name. “Eden Tan” and “陈晏” — what a perfect combination of love, joy and peace. Charles went on to explain that 晏 in one character, carries the same meaning as 平安 (peace) in two characters. Not only that, but it’s “peace that comes with day” because it’s “日” (day) + “安” (peace). To help me understand this, he explained that we sing “Silent Night, Holy Night” because we are looking forward to the peace that comes in the morning, knowing that we have survived yet another unknown night; that’s why we chorus “All is calm, all is bright” in the following line. It was like a double Eureka moment for me — new understanding of that Christmas carol and new knowledge to appreciate the profound meaning of this Chinese character. Another way of looking at 晏 is that everyday (日) Eden will be filled with peace (安) — 每日平安. Charles also explained that 晏 is one of those rare Chinese characters that has not simplified its strokes over the centuries; 晏 in written the same way in both traditional (繁体字) and simplified (简体字) Chinese. So that means that it’s meaning has not changed through time! In addition, what I also liked about this character is how feminine it looks — don’t you think it looks really pretty? And finally, I also saw a pictograph in 晏 — it looks like the sun (日) is forming a protection (宀) over my little girl (女)! And if I may stretch it and “Christianise” its meaning, it kind of looks like the Son is watching over my daughter! In summary, looking at 晏 was like marvelling at Eden for the first time — love at first sight. Through bringing our baby girl to full-term, God has indeed brought us joy and delight, allowed us to experience His grace and love, and taught us the precious lesson of knowing His peace that surpasses all understanding. Eden Tan, Mummy and Papa love you very much — beyond what you can imagine. Thank you for teaching us love, joy and peace even before you’ve met us. You’re going to be an awesome, and very precious daughter. What a privilege it is for Huiyi and I to be your parents.